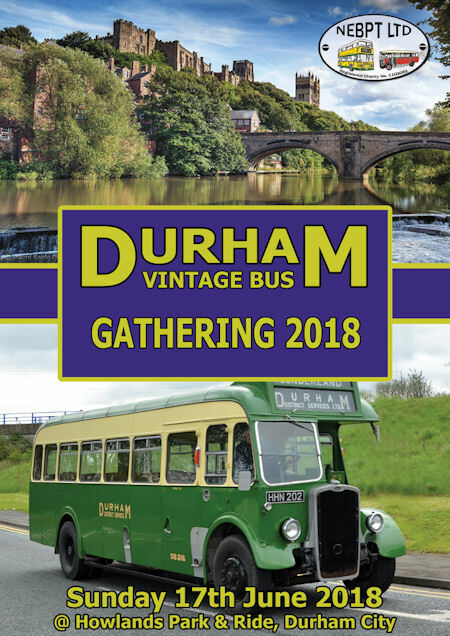 To travel to the event by public transport catch any bus service to Durham City Centre and catch the free bus service from outside the bus station to the site. OSK 831 1958 Karrier BFD3023 Plaxton C14F Alan Dixon New to Brocksbank of Leeds, Original reg 6666 U, later BVH 157A, formerly owned by John Hogarth and Ray Thornton. Some restoration work recently carried out at Gardiners of Spennymoor. 8124 WX 1961 Bristol MW6G with ECW C39F bodywork. North East Bus Preservation Trust Ltd This vehicle was new to West Yorks RCC as fleet no. CUG 27. It was withdrawn from service in September 1973, and passed through a number of private owners until acquired by the late Chris Moyes in 1996. Thoroughly overhauled by Go-Ahead and extensively rallied, this vehicle later passed to NEBPT ownership. WBR 248 1964 Atkinson Alpha with Gardner 6HLW engine and Marshall 48-seat single-deck body. North East Bus Preservation Trust Ltd No. 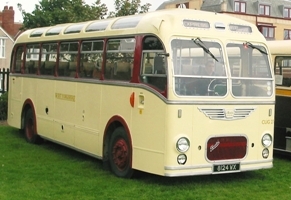 48 in the Sunderland Corporation fleet was one of a batch of three Atkinson chassis, which were to be the last Atkinson passenger chassis to enter service in this country in 1964. Atkinson was better known for its lorry chassis and the company were approached by Sunderland to build these vehicles after unsatisfactory performance from the Corporation's AEC Reliances. The vehicles had Gardner 6HLW engines mounted horizontally underfloor. The bodies were by Marshall to the contemporary B.E.T. specification, similar to other local vehicles at the time. The twin-door bodies were specified to operate on the Pay-As-You-Enter system. The steps into the saloon were very high, compared to the low-floor buses of today. Seating capacity was only 45 due to the dual door layout. SHN 80L 1973 Bristol RELH6G ECW DP49F Lee Garrett SHN 80L (6080) was new to United in the summer of 1973. The vehicle spent the majority of its operating career working from Bishop Auckland depot and chiefly used on the Bishop Auckland to Newcastle service. The vehicle entered preservation upon withdrawal in 1987 and has a number of owners since then. The bus was repatriated to its native North East by its current owner of this year. The plan is to eventually repaint 6080 into NBC poppy red and white, the livery the bus wore whist operating for United. RCU 838S 1977 Daimler Fleetline FE30AGR with Alexander 83-seat double-deck body. North East Bus Preservation Trust Ltd This was one of the last Tyne and Wear PTE standards, built to dual-door configuration and later converted. RDC 106R 1977 Bristol VRT Northern Counties H43/31F 500 Group, New to Cleveland Transit as their H106 in 1977. A typical Northern Counties body but unusually on a Bristol VRT/SL3 chassis. Worked from both Middlesbrough and Stockton Depots. Withdrawn in 1989 and sold on to Jones of Llanfaethlu on Anglesey for further service. Recovered by the 500 Group in 2006, apparently not needing too much work! 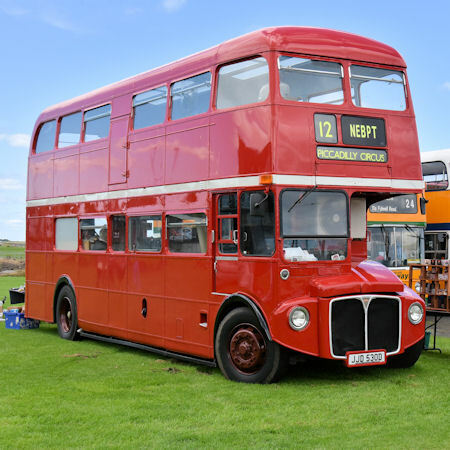 After an eight year rebuild involving many thousands of hours work by a dedicated volunteer team and a 5 figure cost, she debuted in preservation at the Stagecoach Stockton Depot Open day in September 2014. Now entering her 3rd season on the rally circuit. 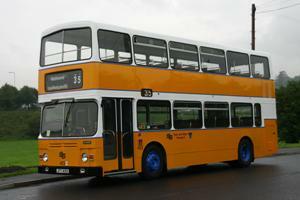 SCN 268S 1978 Leyland Atlantean AN68A/2R Alexander 86-seat double-deck bodywork. North East Bus Preservation Trust Ltd This Tyne and Wear standard Leyland Atlantean entered service based at South Shields, and passed to South Shields Busways after deregulation in 1986. It is preserved in the livery of South Shields Busways. AFB 586V 1980 Bristol LH6L ECW B43F Rob Hughes New To Bristol Omnibus. Worked at Solent Blue Line, Hampshire Bus, TMS, EYMS. Became static living accommodation. FTN 708W 1981 Leyland National MK2 B49F Jonothan Ruddick FTN708W was new to Northern General in 1981. The bus remained within the old Sunderland and District area until withdrawal in 2003. The bus was acquired for preservation in 2007, and since that time has undergone an extensive rebuild due to serious corrosion that was present to the body. Initially presented last season in Tyne and Wear PTE livery, the bus has been professionally repainted into Go Wear Buses livery, over the winter season. JFT 413X 1982 Scania BR112DH Alexander H47/31F Kieth Buckley & Vince Minto New to Tyne & Wear Transport in 1982 as fleet no. 413. Only two of these vehicles were purchased, and only this vehicle survives. It has been recently refurbished at Gardiners of Spennymoor. UTN 501Y 1983 MCW Metrobus Mark 2, ex Northern 3501 with MCW bodywork H46/31F Lee Garrett New on the 12th June 1983, as the first Mark 2 Metrobus to be delivered to Northern and also the National Bus Company. Delivered in NBC poppy red, this vehicle was one of only 12 Metrobuses painted in this livery from new. 3501's first depot allocation was Chester le Street, and moved to Murton Depot after a year at it's previous depot, remained here until Murton closed. 3501 was withdrawn in 2000, and after restored won the best 1980's double decker award at Showbus Rally in Duxford in 2009. The bus is powered by Gardner engine linked to a 4 speed Voith gearbox. The vehicle is fully restored in "as new" condition. The bus was withdrawn fifteen years ago and has been in preservation with its current owner ever since. C656 LJR 1985 Leyland Olympian ECW H45/31F John Tyson Northern 3656, was delivered in Tyne and Wear PTE livery in 1985, 3656 was new to Gateshead Depot, one of a batch of vehicles popular with drivers as the vehicle is powered by a Cummins L10 engine linked to a 4 speed Voith gearbox, giving great performance on the steep hills around Gateshead. 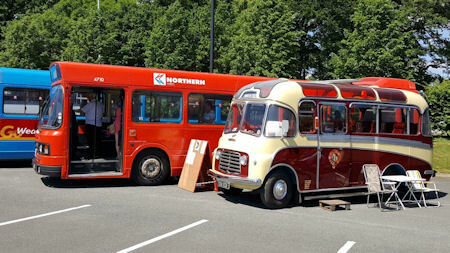 The bus was purchased for preservation in August 2010 from Redfern Travel and has been restored in full Tyne & Wear PTE livery, as delivered. NK53 TMZ 2003 Transbus International Mini Pointer Dart Lee Calder and Kurt Stoves Transbus MPD 574 / NK53TMZ was purchased in September 2017 for Preservation and will be attending her first show since we purchased her following a considerable amount of mechanical work.